I have been meaning to get to this book for years. YEARS. The Mortal Instrument series has the honor of being one of the first series we reviewed and looking back on some of the older reviews I feel like we didn’t give it a fair shake. I mean people love this series and The Powers That Be have so much faith in the story it's getting a TV show after the movie bombed.With all that in mind I decided to go into this book with positive intentions. Did it work ? Ehhhhhhhh….nope. So, the big fight is over and the Big Bad from the first book is gone and we spend most of the book getting to see the characters outside of the whole Hero(ine? )'s Journey. And it is just not interesting. There is this scene in the book where Simon and Jace go grocery shopping (yes, I said Simon AND Jace) and it was so weirdly bizarre, it felt like a parody. I mentioned this to Jess and she said it may be a red herring, but it wasn't. This is kind of like the Half-Blood prince of the series. There is so much relationship drama interspersed, but it's really hard for me to feel any emotion because most of the couples have known each other for a few weeks. Anyway, the plot really gets going when Shadowhunter bodies start piling up around New York City and Clary and the crew are out to find out who did it and why. There is a lot of character development, especially concerning Simon dealing with being a vampire and having the Mark of Cain which means anyone who hurts him is disintegrated. He also meets a mysterious new stranger. Jace is less snarky and more angsty this time around and Clary is being Clary; trying to be a shadowhunter, loving Jace, making up her own runes and yet still being a damsel in distress somehow. I will say this book did make me appreciate Clare's myth building and the way she ties Biblical stories into her magic. Also have I mentioned the Nightmare Fuel ? Once we get to the big reveal there is some top level Fridge Horror. I highly suggest reading the Infernal Devices before going into this book. There are some pretty deliberate *wink nudges* to characters from that series. Including some characters (Okay, Magnus Bane) showing up and doing the "hey remember that Herondale kid..." thing. 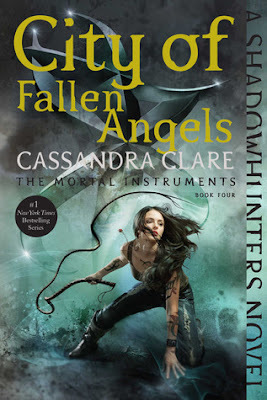 I'm a bitter ender so I'll probably get on to City of Lost Souls...as soon as I find a cheapie copy somewhere.